Climate has changed throughout history due to a variety of factors, with corresponding changes to natural systems. However, in recent centuries, humans have significantly altered the composition of the atmosphere by burning fossil fuels for energy and clearing forests and other natural habitats, contributing to accelerated changes in climate conditions. There is clear and growing evidence that our continued use of fossil fuels and land conversion is increasing the concentration of carbon dioxide and other greenhouse gases in the atmosphere and is a primary contributor to the significant rise in global temperatures that has been observed since about 1950. The concentration of carbon dioxide in the atmosphere in 2015 (about 400 parts per million) is the highest known level in at least the past 700,000 years, and probably much longer, and it continues to rise rapidly. The Intergovernmental Panel on Climate Change (IPCC), an international science body, concluded in 2007 and reaffirmed in 2014 that the evidence is “unequivocal” that the earth is warming at an accelerated rate due primarily to human activities, and that there have been and will be significant changes to the global climate this century. Rising temperatures and other direct and indirect climate effects of increased greenhouse gases make up the body of interrelated trends referred to as climate change or global warming. These substantial shifts in global climate variables are observable in today’s climate, and they are expected to increase and accelerate through at least the next century or until well after human-caused emissions of greenhouse gases are returned to much lower levels. As a result, climate change will cause irreversible alterations to both human communities and ecological systems. Climate change will bring significant impacts not only to wildlife and their habitats, but also to working landscapes and rural, urban, and tribal communities. These impacts will likely include threats to water resources, range degradation due to invasive species and increased drought, and increases in fire and pest outbreaks in forests. Many of the available approaches to helping wildlife adapt to climate change can also help human communities cope with these changes. Photo Credit: Keith Kohl, ODFW. Sunset over Mount Hood. By the 2080s, the mean annual air temperature in the Pacific Northwest is projected to increase by 2.5-3.4°C (IPCC report). This warming is projected to be the highest during the summer. Annual precipitation patterns in the Pacific Northwest may also be changing. While there is always uncertainty in projections, the general trend shows winter precipitation to increase and summer precipitation to decrease by 10-15 percent. A majority of models (68-90 percent depending on period and scenario) project decreases in summertime precipitation, reaching a decrease of 14 percent in the Pacific Northwest by the 2080s. In terms of how changes in air temperature affect fall and winter snowpacks and hydrologic regimes, the biggest signals are for changes from snow-dominated systems to rain-dominated systems. By the mid-century, with a projected 2°C winter warming, 9,200 square kilometers of currently snow-covered area in the Pacific Northwest would receive winter rainfall instead of snowfall. There has already been a significant shift toward earlier peak flows throughout the western U.S. Unregulated smaller, rain-fed and mixed rain/snow streams west of the Cascades are already susceptible to winter flooding, especially in wetter La Niña winters. Future changes in stream temperature in response to climate change in Oregon will depend on: 1) the degree to which warming results in a reduction of late summer streamflow, and 2) how warming influences riparian vegetation. Global changes in the marine environment include sea level rise, ocean acidification, and temperature increase. Sea level will rise along some parts of the Oregon coast; in other areas, the impacts of rising global sea level will be offset by an upward shift in land elevation over this timeframe. As carbon dioxide increases in the earth’s atmosphere, ocean waters become more acidic. The more acidic waters can weaken crucial marine life structures, such as shells and coral reefs, and even alter the metabolism for some marine species. Temperature changes also have great impact on the marine environment. Water temperatures are a key factor in the mixing of warmer, oxygen-rich nearshore waters with cooler, nutrient-rich off-shore waters. Marine organisms depend on cooler, nutrient rich waters brought to the surface by a process called “up-welling”. Up-welling occurs in the spring and summer, driven by off-shore winds, supporting strong nearshore productivity. Conversely, “down-welling” occurs in the fall/winter, and brings oxygen rich nearshore water into deeper areas, supporting deeper-dwelling lifeforms. The warmer the upper layer of water is, the more resistant it is to mixing with the cooler water, reducing the intensity of up- and down-welling, and thus overall ocean productivity. Each of these expected changes would cause a cascade of direct and indirect effects in the natural environment, further stressing systems that have already been impacted by disease, invasive species, habitat loss and fragmentation, land use changes, and rising water demands. For example, rising temperatures will likely continue to affect the state’s forests and shrublands, exacerbating fire conditions in many woody ecosystems, drying soils, and increasing some forest pests. This may result in major shifts in the types of vegetation found in some parts of the state, especially where severe fires set the stage for colonization by invasive non-native plants. Warmer temperatures are already reducing spring snowpack. By 2040, early spring snowpacks are expected to decline as much as 40 percent in the Cascade Mountains, resulting in shifts in stream flows that will degrade habitat for native aquatic species. Climate change presents unprecedented challenges for Oregonians and for fish and wildlife managers, but taking proactive measures to prepare for the impacts on the state’s native species and habitats will make these challenges more manageable. In 2007, the Oregon legislature established the Global Warming Commission to address the inter-related climate impacts on natural resources, communities, commodities, business, and our economy. The Commission brought together representatives from industry, transportation, agriculture, forestry, energy, public health and safety, and other key stakeholder groups. The need to coordinate across political and jurisdictional boundaries. In 2010 and 2011, ODFW and partners hosted a series of expert workshops to identify climate change impacts on Strategy Habitats and begin to develop climate change adaptation strategies. These workshops focused on 3 of the 11 Strategy Habitats: estuaries, oak woodlands, and sagebrush habitats. Climate change is one of the most serious KCIs affecting Oregon’s fish and wildlife populations. Climate has always influenced habitat for fish and wildlife, and affects the fundamental conditions in which a species can exist. As climate conditions change over time, the habitat conditions for fish and wildlife at many locations may also change. Changes in climate have always occurred. Today, however, climate change refers to far more rapid changes that are generally accepted in the scientific community as resulting from the increase in the concentration of greenhouse gases in the earth’s atmosphere. Oregon’s climate is changing, as described in a statewide assessment completed in 2010 (OCAR report) and more recently in the Pacific Northwest chapter of the National Climate Assessment, completed in 2014. In 2010, Oregon completed a state-wide Oregon Climate Adaptation Framework, which describes 11 climate risks that are anticipated to affect the state in the coming decades. Note that while most of these risks will occur across the whole state, they will occur in different ways and magnitudes in different parts of the state. The 2010 Framework lists climate risks and indirect risks related to climate change. The true climate risks include increased average temperatures (daily, monthly, seasonally, annually), changes in precipitation patterns and hydrology, and changes in ocean chemistry and water levels. These risks act as drivers that will affect landscape conditions like wildfires, flooding, drought, coastal erosion, landslides, invasive species and pests, wetlands, and fish and wildlife habitats. In other words, climate drivers will force changes in a range of landscape conditions that directly affect habitats for aquatic and terrestrial species. Climate change will exacerbate the effects of drought and fire on Oregon’s fish and wildlife and their habitats. Also, climate change can impact species directly, as described in the next section. Photo Credit: Justin Miles, ODFW. A Pacific Giant Salamander searching for food on the forest floor in the Oregon mountains. Warming temperatures are already affecting Oregon’s fish and wildlife and their habitats. Insects are moving up from states south of Oregon, and significant pest species, such as the mountain pine beetle, are increasing in numbers as a result of warmer winter temperatures. Many bird species are shifting their ranges to the north and migrating earlier in the year. Warmer temperatures are also causing longer, more intense fire seasons and increased fire damage in some forest types. Any or all of these changes have the potential to directly and/or indirectly affect fish and wildlife populations and their habitats. In the face of rapidly changing climate conditions, some species will need to shift to new locations or adapt in-place to new conditions. Populations that fail to move or adapt may decline. Others may thrive. Some climate risks will directly jeopardize the success of organisms dependent on specific habitat components. In the case of ocean acidification, many organisms that depend on calcite and aragonite for shell and skeletal development may perish due to reduced availability of carbonate. Species that can move to a more climatically suitable location will do so by migrating or shifting their range. Range shifts have already been noted for many species, including poleward and elevational movements of many insects, birds, fish, and vegetation communities. However, the rapid rate of change and the fragmentation of habitat will make it more difficult for many species to move. Some species may have to stay in place, either because they have limited abilities to move or because suitable habitat is not available elsewhere. These species may need to alter their behavior or the timing of their migration or reproduction to respond to changes in habitat conditions, such as food availability, habitat loss, and novel species interactions. The rapid rate of climate change, compared to past shifts in climate, means that species adaptation may have to occur very quickly for the species to be successful. Species that are negatively affected by climate change will likely include species with very specific habitat requirements, including those that depend on high-elevation, coldwater, or wetland habitats. If species are unable to adapt to the rapidly changing environment as a result of climate change, they could potentially become locally extinct. In eastern Oregon, for example, the ranges of small mammals in mountaintop habitats are contracting along with the snow caps, and some of the state’s native frog populations are declining due to the seasonal increases in temperature and associated drying of wetlands. Photo Credit: Keith Kohl, ODFW. Dust devil in the forefront of Mount Thielsen, Oregon. Uncertainty has always been recognized in climate models and in managing fish and wildlife populations for future conditions. On-the-ground research, combined with predictive models, will continue to help managers learn more about how fish, wildlife, and their habitats may respond to future conditions. Adaptive management continues to be an important tool for managers coping with unpredictable changes in natural and biological systems. Lack of certainty about exactly how species or communities will respond to climate change should not prevent managers from identifying and implementing management actions that will help mitigate likely future changes. Given the serious broad-scale and progressive nature of climate change, the time to begin adapting to future climate conditions is now. Goal 1. Use the best available science, technology, and management tools to determine the vulnerability of species and habitats to climate change at a landscape scale. Climate change is a global issue, and the responses of fish, wildlife, and habitats to changing climate conditions will play out across political boundaries and will require a new, more integrated approach to management. As a result, evaluation and planning needs to be done at a landscape scale. Many species may shift ranges so that they are no longer found within the borders of a particular state or protected area. Therefore, efforts to evaluate and mitigate vulnerability should focus on how a species or habitat will respond across the landscape. Action 1.1. Work with partners to increase information on climate change vulnerability of habitats and species. Building a body of information on climate change impacts and the vulnerability of Strategy Species and Strategy Habitats is an important first step to guiding management and policy decisions on climate change. Management priorities should drive the scientific information that is gathered to inform decisions. Collaboration with research institutions, such as the Oregon Climate Change Research Institute, Department of the Interior Northwest Climate Science Center, University of Oregon’s Climate Leadership Initiative, and University of Washington’s Climate Impacts Group, nonprofits, and other government agencies can help increase understanding of climate change vulnerability without overtaxing limited budgets. Many of these institutions have ongoing efforts to identify the most vulnerable species and habitats and develop assessment models for these species. Participants in the three habitat-focused workshops identified priority information needs by asking, “What questions do we need answered in order to be able to move forward with climate change adaptation strategies?” A similar approach, based around the information requirements of land and resource managers, would help prioritize research needs. The University of California, Davis used NatureServe’s Climate Change Vulnerability Index to conduct a vulnerability assessment on 46 Strategy Species in the Willamette Valley ecoregion. The study also conducted a preliminary assessment of sensitivity to non-climate threats and climate change vulnerability for 27 COAs. The results of the study can be found in Assessing species and area vulnerability to climate change for the Oregon Conservation Strategy: Willamette Valley Ecoregion. Action 1.2. Support long-term research on climate trends and ecosystem responses. To provide needed information on climate impacts on species and habitats, research and monitoring efforts will need to be conducted over longer periods of time. Long-term funding and institutional support will be needed to encourage long-term research. Existing long-term ecological research programs, such as Oregon State University’s (OSU) H.J. Andrews Experimental Forest, the U.S. Forest Service’s (USFS) experimental forests, and the ODFW’s Lifecycle Monitoring Sites can be a cornerstone of such efforts. The results from these research efforts should be used to inform and adapt management strategies, monitoring protocols, and objectives for Strategy Species and Habitats. The Nature Conservancy (TNC) has undergone a project to identify Resilient Terrestrial Landscapes in the Pacific Northwest, which are areas that will best sustain native biodiversity, even as the changing climate alters current distribution patterns. The Nature Conservancy identified Climate Change Resilient Landscapes in the Pacific Northwest. Results of the project are provided as downloadable GIS data, interactive online maps, or high resolution PDF map graphics. Action 1.3. Develop and implement monitoring and evaluation techniques for vulnerable Strategy Species and Strategy Habitats. Because of the changes expected under future climates, new decision tools will be needed to help determine appropriate management actions. There is a need to develop monitoring protocols that can quickly detect climate-related shifts in populations and habitats, help tie existing and proposed management with on-the-ground results, and inform and refine vulnerability assessments. Evaluating actions will be critical to coping with future climate uncertainties. To make the most efficient use of available funding, monitoring should be coordinated and shared among relevant agencies and organizations. Monitoring across boundaries and jurisdictions will form the basis for decision-making in a variable and rapidly changing environment. Goal 2: Identify, prioritize, and implement conservation strategies to mitigate the negative impacts of climate change on fish, wildlife, and habitats. Action 2.1. Incorporate currently available climate change information into management plans for species and habitats. Focus on strategies that are robust to a range of potential future climates and that maintain or restore key ecosystem functions and processes. looking for opportunities to protect species and habitats in their likely future locations. One way of coping with uncertainties about future climates and the responses of species and habitats is to focus on identifying and implementing management approaches that are likely to be successful under several climate scenarios. For example, scientists have a very high level of confidence that temperatures in the Pacific Northwest will continue to rise over the next several decades, on the order of 1-5°C by mid-century. However, it is less clear whether or how precipitation patterns are likely to change. Efforts to identify robust adaptation strategies for a particular species or habitat might involve considering two or more climate scenarios with different degrees of warming precipitation conditions. Management actions that are likely to be successful under multiple scenarios are preferable to those that only make sense under a narrow range of future conditions. Some researchers have even suggested that conservation planning should be based on geophysical classes rather than biological communities. Action 2.2. Minimize other threats. Many of the best available climate change adaptation strategies involve managing other threats to species and habitats. Because rapidly-changing climate conditions will interact with, and may exacerbate, the other KCIs described in the Conservation Strategy, working to reduce these other threats is a good way of moderating the effects of climate change on fish, wildlife, and habitats. Reducing non-climate threats also tends to be a low-risk approach with a relatively high likelihood of success, because many non-climate threats are better understood, managers have more experience in applying action plans, and the actions taken are not as dependent on the accuracy of future climate predictions. For example, protecting a representative network of natural and semi-natural lands for long-term conservation management is one of the most effective tools for coping with both climate change and other conservation threats, because relatively intact ecosystems are more likely to be more resilient to climate change, will better sustain fish and wildlife populations facing climate threats, are more likely to facilitate migration, and may even transition more smoothly to future climate conditions. Action 2.3. Develop regional and local partnerships to coordinate responses to climate change across political, cultural, and jurisdictional boundaries. Using the work of regional and national efforts, such as the Association of Fish and Wildlife Agencies’ Subcommittee on Climate Change, to identify policy options and goals for multiple agencies and organizations to address common concerns related to local, regional, and national impacts of climate change. Working with agencies and stakeholders from different sectors to develop consensus-based regional policies that inform and direct local decisions on climate change. Both the causes and effects of climate change are closely linked to human communities, and the impacts of climate change on natural communities cannot be successfully managed in isolation from human systems. Developing comprehensive education and outreach tools for the public on the impacts of climate change on wildlife and their habitats. Providing information on climate change and its impact on both human and natural communities will help solidify public support for adaptation efforts. Local and regional governments and citizen-based nonprofits and organizations (e.g., SWCDs, watershed councils) can help develop and deliver these educational materials to their constituents. Strengthening current partnerships and collaborations, and developing new ones, to pool funding and resources and encourage cost-effective strategies for addressing climate change impacts and adaptation. Establishing mutual goals for managing species and habitats in response to climate change. Potential partners include: the U.S. Geological Survey (USGS) Forest and Rangeland Ecosystem Science Center, the Department of the Interior regional Climate Science Centers and Landscape Conservation Cooperatives, U.S. Fish and Wildlife Service (USFWS), Bureau of Land Management (BLM), and other state and federal agencies, academic institutions, and non-governmental organizations. Developing interagency and intra-agency strategies to identify research needs, establish database capacities, and share data can help reduce costs and avoid duplicative efforts. The proof of concept project was accomplished in three all-day workshops. The Oregon Climate Change Research Institute (OCCRI) was created by the Oregon state legislature in 2007 to: foster climate change research among faculty of the Oregon University System, serve as a clearinghouse for climate information, and provide climate change information to the public. OCCRI also houses the Oregon Climate Service and serves as the anchor institution for two federally-funded regional climate science centers, the Climate Impacts Research Consortium (CIRC) and the Northwest Climate Science Center, which provides information and tools for adapting to a changing climate in the Northwest. 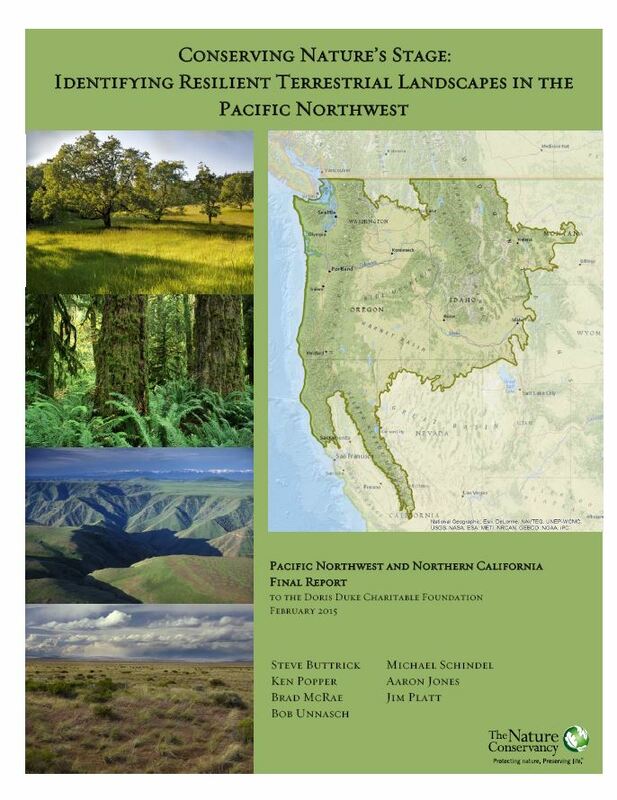 OCCRI has produced two assessment reports of climate change and impacts in Oregon and the Northwest and releases a monthly newsletter featuring recent articles and projects pertinent to the Northwest. A recent project, Integrated Scenarios of the Future Northwest Environment, evaluated and down-scaled global climate models for the Pacific Northwest and produced coordinated simulations of hydrology and vegetation for the region. The project’s data are publicly available. The U.S Department of the Interior established eight regional Climate Science Centers (CSCs) to address environmental challenges resulting from climate change and to provide natural resource managers with rigorous scientific information and effective tools for decision making. The Northwest Climate Science Center (NW CSC) was established in 2010 to give resource managers the scientific information and tools they need to anticipate, monitor, and adapt to climate change in Oregon, Washington, Idaho, and western Montana. The NW CSC is located in Corvallis, Oregon. The NW CSC is supported by 14 academic institutions primarily led by Oregon State University, the University of Idaho, and the University of Washington. Scientists from the academic consortium, U.S. Geological Survey, and other agencies provide capabilities in climate science and modeling, ecology, vulnerability assessments, and advanced information technology to address and respond to climate change in the Northwest. The NW CSC also communicates climate change impacts to various audiences, trains the next generation of climate scientists, provides easy access to data products, and develops strong ties with federal, state, and tribal resource management agencies. Since fiscal year 2011, the NW CSC invested nearly $5 million in research projects that address critical climate-related issues in the Northwest. Significant efforts include projecting future climate trends for our region and understanding how warmer temperatures and altered snow and rainfall patterns will affect stream flows, flood events, droughts, and wildfire frequency. Other NW CSC-funded research has focused on the effects of climate change on habitats of bull trout, Northern Spotted Owl, and Greater Sage-Grouse, all of which are Oregon Strategy Species. The NW CSC requires all projects point to ways in which research results can be used by managers to help conserve target ecosystems or species. A full list of NW CSC projects can be found here. The NW CSC has also developed a Regional Climate Science Inventory. This includes climate research efforts of the entire CSC network and partner agencies and organizations in the Northwest.